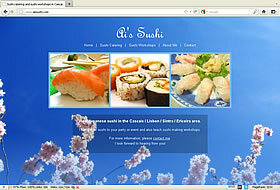 Sushi catering and workshop services in Portugal's Lisbon, Cascais and Sintra areas. The website and service was much better than I could ever have expected! WDJ worked with me throughout the whole process and took the time to explain eveything to me in an easy to understand manner. All of my questions were answered with great care and all communication was fast and effecient. The final website is beautiful and refects my business perfectly. Thank you so much for the great site!